Shalom! My name is Selah Gitlin, and on December 28th, 2011, my husband Elul and I made Aliyah from America to Nahariya, Israel. Nahariya is at the very "top" of the country, on the Mediterranean Sea and about six miles south of the Lebanese border. I was born in Seattle, Washington, but grew up in Ann Arbor, Michigan. After graduating from Eastern Michigan University in 1989, with a very practical (not!) major in music (vocal performance) and a second one in anthropology, I took off for Europe. My first job was in Finland, where I taught English as a Foreign Language to Finnish businesspeople, and learned to detest snow even more than I already did from having grown up in Michigan. Two winters later, I begged for a transfer and got it. I then moved to France, where I taught in Dijon and Paris. Enter (now-ex-) husband number one. We got married and, having nothing better to do, I went to graduate school at the University of London's School of Oriental and African Studies, where I specialized in Middle Eastern Studies and learned another big-earning skill: rudimentary Turkish. A few years later, we moved to Ireland, where we then lived in Kells, County Meath, and Omeath, County Louth--a dodgy little seaside village on the border of Northern Ireland. The marriage broke up, and after regrouping in Dublin for some time, I got sick of the rain and moved to Pahrump, Nevada in 2003. There was plenty of sun there (along with some brothels and casinos), but not much else! But then it got much better, when I met Elul in 2006. I'd actually first spotted his handsome mug on a billboard going out of town, years before, as he was then the local news anchorman. We met through an online dating site, and after our first date at the oh-so-classy "Town Hall Bar and Saloon," we were never apart. We spent many happy years together in our little doublewide on the dusty high-desert plains, until we'd had enough and wanted to move to Israel. I converted to Judaism on December 21st, 2010, at Temple Sinai of Las Vegas, and had my bat mitzvah there on June 25th, 2010. Even though we had already had a civil wedding years before, Elul and I had a full Jewish wedding the very next day. Aww! Our application to Nefesh B'Nefesh and the Jewish Agency was already in the works, but Elul's father passed away suddenly and we spent a year in Boca Raton, Florida, to be closer to Elul's mother. It was a gut-wrenching move to leave our beloved congregation there. Fortunately, my mother-in-law has made a good adjustment to widowhood and Elul's sister also lives close by. Although we had to delay making Aliyah a little, we never gave up on our plans. We made our pilot trip, immediately chose Nahariya as the best fit for us, and kept going. The worst part of the pilot trip was the day we had to fly back to Florida. Florida is beautiful, and the people we met were (and still are) absolutely fantastic, but we felt so immediately at home in Israel that it felt as if we were going right back into exile. I started this blog just to share my experiences about what it's like to make Aliyah mid-life. As an anthropologist who is deeply in love with all things Middle Eastern, as well as a proud (albeit newly-minted) Jew, I find it both intellectually satisfaying and deeply spiritually fulfilling to live here. I am neither a retiree nor a spring chicken with my whole life ahead of me, so it's an interesting position to be in life--some opportunities have come and are gone forever, but others, which I might not have spotted when I was younger, have appeared. I can honestly say that I wake up every single day with a sense of tremendous gratitude, relief and thanksgiving that we are finally here. I hope I can share some of my love of life in Israel with you. 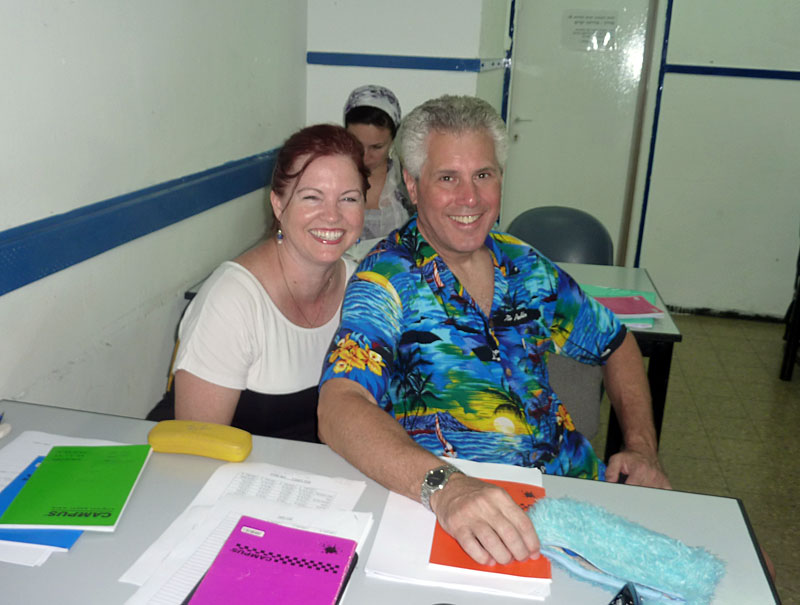 Elul and me, on the last day of Ulpan Nahariya.